The gist: a kid’s name can tell us something about his parents — their race, social standing, even their politics. But is your name really your destiny? CONLEY: Of course it’s hard to separate out cause and effect here until Kim Jong-Un allows me to randomly assign all the names of the North Korean kids…but my gut tells me that it does affect who you are and how you behave and probably makes you more creative to have an unusual name. Indeed, there is some evidence that a name can influence how a child performs in school and even her career opportunities. There’s also the fact that different groups of parents — blacks and whites, for instance — have different naming preferences. Stephen Dubner talks to Harvard professor Latanya Sweeney about a mysterious discrepancy in Google ads for Instant Checkmate, a company that sells public records. Sweeney found that searching for people with distinctively black names was 25% more likely to produce an ad suggesting the person had an arrest record – regardless of whether that person had ever been arrested. The Harvard computer scientist Latanya Sweeney found that searching for her name in Google produced an Instant Checkmate ad with the text “Latanya Sweeney, Arrested?” — even though she has never been arrested. So you might think that names make a big difference. But Steve Levitt insists otherwise. In a paper called “The Causes and Consequences of Distinctively Black Names,” Levitt and Roland Fryer argue that a first name doesn’t seem to affect a person’s economic life at all. OLIVER: [O]ur educated liberal mothers tend to be choosing names that are obscure cultural references. And so these are the Esmés and the Unas and the Archimedes and the Emersons. And we think this is a way that liberals sort of signal their cultural — for lack of a better word — their sense of cultural superiority. 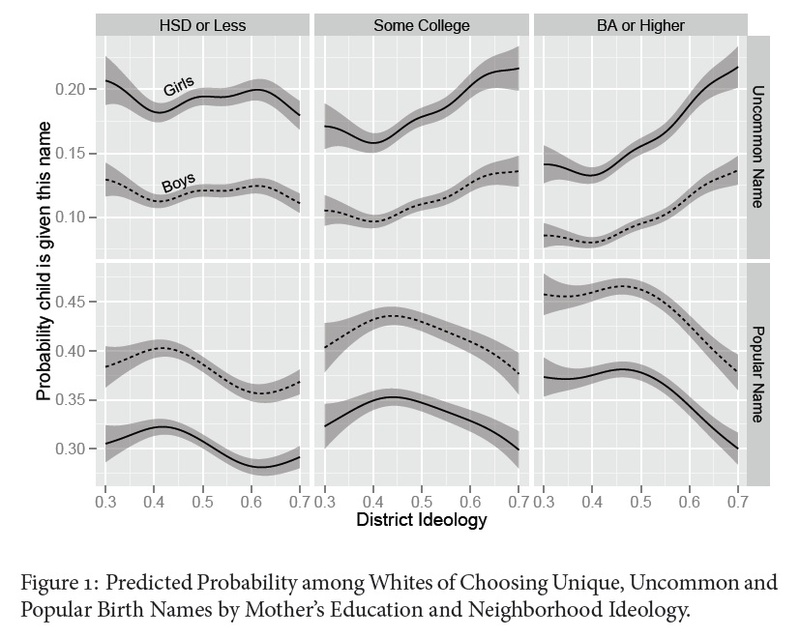 Eric Oliver found that more educated mothers generally choose more common names, but that ideology makes a difference: high-education liberal mothers tend to choose uncommon names. Finally, you’ll hear filmmaker Morgan Spurlock talk about his take on the names debate in the Freakonomics film. Throughout the episode, you’ll hear from podcast listeners who called in to our names hotline. Thank you to everyone who participated. Even though we were able to use only a few of the messages, it was great fun to hear from all of you about your wild and wonderful names. If checkmate is running a decently advanced Adwords campaign and have good source data, they may have done their own analysis on the names that were associated with arrest records to come up with a decent source list and understand which fragments of names were more associated with arrests. Or they're split testing the ads as suggested in the podcast. I can't believe my son, Rocket's phone call got played! So awesome- he's gonna be thrilled when he gets home from school. And you hear Roxanne scream "YOW" at the end of the call- she got in trouble for trying to ruin his well-rehearsed speech. I wonder about that black vs white name thing. At least, when I think about my co-workers in high-tech California, ALL the American black ones I can instantly recall had white-sounding names like Mark, Tony, Charles, & Nicole. You answered your own question. "Coworkers in high-tech California" likely had parents who went to college or at least pushed them to succeed in school to be able to get such jobs. "Black sounding" names are most likely far less common in California than they are in areas to the south and east. The practice of giving your kid an African name is the southern black variant of the southern white practice of giving your kid a waspy surname as their first name. Both groups are actually doing exactly the same thing - you just don't notice the white variant (as much) if you're white. James probably doesn't have a lot of white co-workers named Preston or Hunter either. In my opinion, the name you were given as a child has no affect on what your future could have in store for you. A persons personality, morals, and philosophies control the path that person will take in life. A persons name is everything in a different perspective representing, ones culture, ethnicity, and race. The chance is, if you were born from parents whom acquired intelligence, you yourself did as well and vice versa. I am not saying one can not change his/her path, they can, but the odds look as if the kids will follow in their parents foot steps. and thats why it's your OPINION and not a fact. The book "Drunk Tank Pink" says your name does matter on your economic outcome -- if your name is easy to pronounce, you get ahead. Not if it is black or white, but easy to pronouncs. There are potentially significant errors with the analysis of Adwords ads you provided because there was no mention of reviewing the ad campaigns for the Identity name company. I wonder if these were considered? First of all, the advertiser can put black/white names into different adgroups, and give those adgroups a bid bias - meaning, despite the click-through dynamics, those ads will show more often. The bias experienced could easily have been artificially introduced by the advertiser by simply running them in parallel, each using different "dynamic keyword insertion" and "default text" settings. One adgroup could have been African-American names and the other white names. The outcome of the resulting ad displays would have been affected. Is there any data/ research about what happens to a child's education/ adult's labour market success after changing one's name? as a person with a common first name, a common last name, and a famous name, i wish my parents had named me and my brother something a bit more creative. jennifer and michael? please. 1. i've met other jennifer lopezes, i've accidentally gotten both of our tuition bills (eek!). 2. in second grade, i had eight kids in my class. three of us were jennifer. ridiculous. 3. i've had doctors' offices hang up on me thinking it was a prank call to make an appointment for "jennifer lopez". unprofessional. 4. everyone thinks it's funny and tries to make a joke. When naming our children we wanted names that were uncommon but not unusual. Our daughter is Josephine (Josie) and our son is Easton (Ansel Adams middle name). There were other names that we thought were pretty for our daughter, but when we discovered how popular they had become we deliberately avoided them. We did not want our child to be one of 4 Emmas in her class or our son to be one of 4 Jacobs. I think a name not shared by many kids of the same age group lends itself to a sense of individualism, which we want to instill in our kids. Although this video might not be 'PC', it does highlight the trend in black names to add a little 'twist' to pronunciation. Excellent episode by the way. Very interesting insights into the causes, effects (and non-effects) of a name. My usband and Iwere watching an old movie where the Grandfather's name was (whatever) the son's was called two because he was (whatever jr.) and the Grandson's name was three. We thought it would be cool to do that if we had a son, becase it would work with our family. So we had Charles Bolllinger, III; from day one we called him Three. He was for years of age when he foundout that his real name was Charles. He is now an adult an still uses Three, although not professionally.I d not regret naming him Three. And by the way we are conseratives with some college. Very interesting podcast. I think you guys are mostly on point, specific to our society. I'd be interested in a comparison interculturally/internationally. One comment got me thinking about this... when Morgan Spurlock at the end says that ultimately parents name their children with the intent of creating the best life for them, whether they are aware of it or not, because all parents inherently think their child is more special than the rest and that their child some special force that will carry them above the rest. I agree this might be a somewhat ubiquitous sentiment in the states, but at a global level, it could be a very ethnocentric and biased statement. If you think about the people in much more disadvantaged situations worldwide, people who live in extreme poverty, much of their outlook on life success and ability is based on their own experience- one that does not include the possibility of enhancement, stability, success or fame. While I agree with all opinions suggested in the podcast, I just wonder about the cultural lens through which the exploration of names is looked at. It'd also be interesting to see which names that have been more recently created are crossing languages (like John and Juan). As the only Achilles from Cincinnati, Ohio from 1983-2007 I KNOW for a fact my name mattered 1oo% of the time. For good and bad. And as the only Achilles in Korea (guessing) from 2007 to now it still matters for sure. Loved this podcast; sorry you guys did not find the developer my company worked with in the 1980's. He was from Oklahoma; his name was Never Fail. His brother was named Will Fail. Never (and his son Never Fail Jr.) were quite successful, and dashing examples of real estate developers at the time. Here in SE Tennessee the family rules require repeated reuse of the same names, but never a "Junior." I am named for my two uncles.